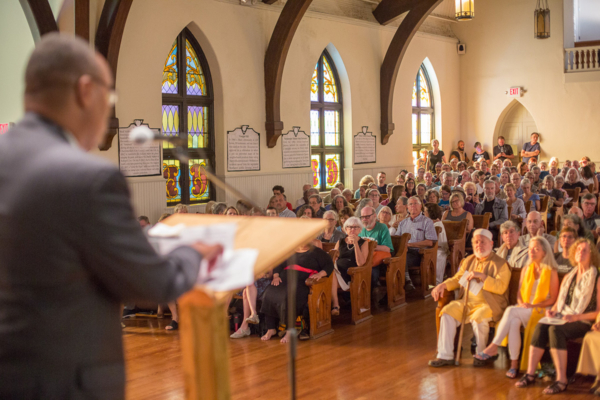 [Episcopal News Service] The three Episcopal congregations in Charlottesville, Virginia, are participating in a weeklong series of ecumenical and interreligious events to promote peace, faith and unity one year after a white supremacist demonstration turned violent, thrusting the city into a national debate over race and Confederate symbols. 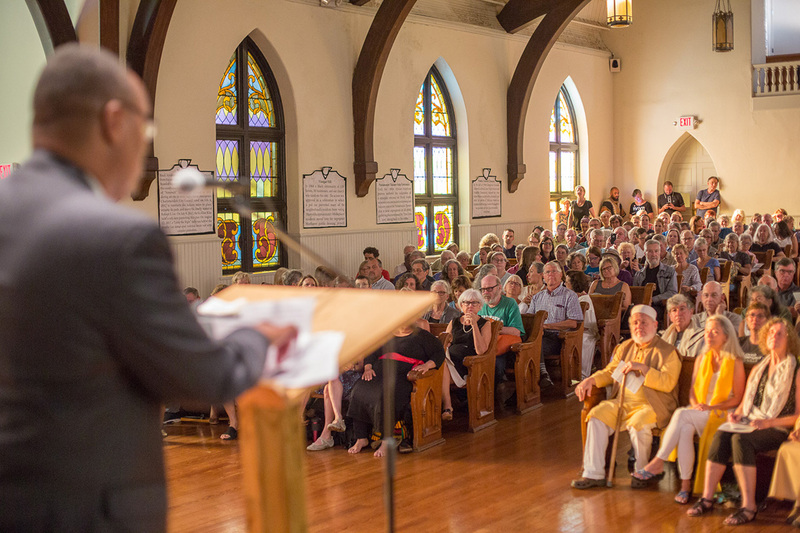 Prayer gatherings have been scheduled twice each weekday this week by the Charlottesville Clergy Collective, of which the Episcopal churches are a part. The collective also organized an evening worship service Aug. 9 described as “a service of gratitude, repentance and hope.” And an afternoon “singout” on Aug. 12 is expected to draw hundreds. That positive image is intended as a contrast to the events of Aug. 12, 2017, when one counter-protester died amid clashes with a large assembly of neo-Nazis, Ku Klux Klansmen and other hate groups who had come to Charlottesville for a “Unite the Right” rally in opposition to the city’s plans to remove two statues of Confederate generals. A year later, the legal battle continues over the statues, which remain in place. The white supremacists appear to be focusing on a new rally in Washington, D.C., on the anniversary rather than returning to Charlottesville en masse, which has relieved some anxiety locally, Bailey said. “Police are still gearing up for the worst-case scenario,” Bailey said. The city’s security measures this weekend will make it virtually impossible to hold worship services downtown, so Christ Episcopal Church decided to close for the weekend and will worship in the morning with Bailey’s congregation at Trinity and in the evening at St. Paul’s Memorial Church. The Diocese of Virginia and its clergy and congregations, meanwhile, have expressed support for the churches in Charlottesville a year after many of them came to the city and joined with the faith community in standing against racism and hatred. The events last year in Charlottesville turned this Southern university town into a flashpoint in the larger debate over the Confederacy and the Civil War’s ugly but enduring legacy of racism. Episcopal institutions, too, were swept up in that debate. Washington National Cathedral altered its stained-glass windows to remove Confederate symbols. Sewanee: University of the South moved a Confederate general’s monument from a prominent byway in Sewanee, Tennessee, to a campus cemetery. An Episcopal church in Lexington, Virginia, that had been known as the R. E. Lee Memorial Church in honor of the Confederate Gen. Robert E. Lee changed its name to Grace Episcopal. 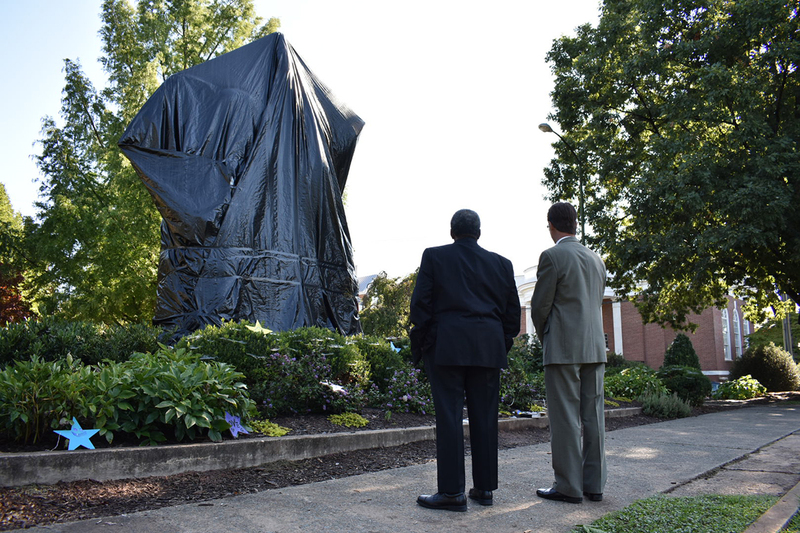 When Presiding Bishop Michael Curry traveled to Charlottesville for a pastoral visit, most of his itinerary was filled with clergy meetings and an evening sermon promoting love over hate, though he also took a few minutes to reflect at the foot of the downtown statue of Lee, which at the time was wrapped in a black tarp. The tarp is gone, but the statue is still visible from the second-floor office window of the Rev. Paul Walker, rector of the historic Christ Episcopal Church in downtown Charlottesville. He returned just last week from a four-month sabbatical and was not involved in the decision by other church leaders to close this weekend, but he thinks it was the right call. Other downtown churches were making similar arrangements to worship elsewhere. Virginia’s governor also has declared a state of emergency in Charlottesville because of the potential for renewed unrest. “I’m very grateful that all hands are on deck for the weekend, because last year was horrible, deeply traumatic for our city,” Walker said. Even a small group of white supremacists could set off a crisis, said the Rev. Will Peyton, rector of St. Paul’s Memorial Church, which overlooks the campus of the University of Virginia. “I think there’s a strong sense, in terms of the city and state police … that law enforcement and government are going to be overprepared rather than underprepared,” Peyton said. City officials were criticized last year for being unprepared for the “Unite the Right” rally, starting with the white supremacists’ Charlottesville Clergy Collective torchlight march in the evening of Aug. 11 at the University of Virginia rotunda while Episcopalians and other concerned citizens had gathered across the street at St. Paul’s for a prayer service. The next morning, members of St. Paul’s, Trinity Episcopal and Christ Episcopal joined an interfaith prayer service and then participated in their own march to Emancipation Park to rally against the supremacists’ event planned at the park, the site of the Lee statue. Before the supremacists’ rally even started, the city deemed it an unlawful assembly and forbid it from proceeding as club-wielding and gun-toting white supremacists began clashing with counter-protesters, some of whom also carried weapons. The street clashes continued and even escalated, and the police force was later blamed for failing to keep the violence in check. That afternoon, a crowd of counter-protesters was rammed by a car, killing 32-year-old Heather Heyer and injuring 19 others. A 20-year-old Nazi sympathizer from Ohio was charged with her murder. Since then, Charlottesville has seen a dramatic turnover in its leadership. The city attorney left, the city manager is leaving and Charlottesville has a new mayor, Nikuyah Walker, the first black woman to hold that office. And after the former police chief stepped down in the face of a report critical of his department’s response on Aug. 12, Charlottesville has a new police chief, RaShall Brackney. That’s not to say that Charlottesville has solved all of its own problems, some of which stem from long-simmering racial divisions that were brought to the surface by last year’s violence. Peyton described the community as suffering from a sort of collective post-traumatic stress disorder, still shell-shocked from the events of a year ago, and on the anniversary, the national spotlight has returned along with memories of the horror of that day. As for the legal battle over the statues – which, at least nominally, was the catalyst for last year’s violence – most accept that “to a certain extent it’s out of our hands,” Bailey said. But the work of racial reconciliation continues. 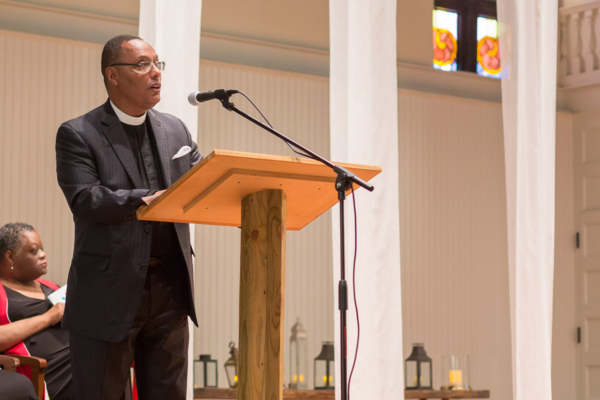 His church recently received a $11,000 grant from a local foundation to launch an African-American history project, featuring video interviews with older members of the community and workshops on the issue of historical trauma. The first event will be held this fall. – David Paulsen is an editor and reporter for the Episcopal News Service. He can be reached at [email protected].